This slot has the look and feel of a great slot from yesteryear and that is the point. Barcrest’s Jewel in the Crown slot machine is certainly a trip down memory lane. This slot has been designed with old-school slot machine games in mind. The game features an ever-popular theme and the way that Barcrest have shaped it is to be reminiscent of the golden age of one-armed bandits and the like. Find out what else Jewel in this game has to offer in our Jewel of the Crown slot review. The Jewel in the Crown slot contains some pretty retro-looking graphics. You can expect to be able to find the standard high playing card icons, and precious jewels forming the main selection of the Jewel in the Crown slot graphics. There is nothing particularly noteworthy about the quality of those graphics, but they do lend a bit of authenticity to the old-school theme. 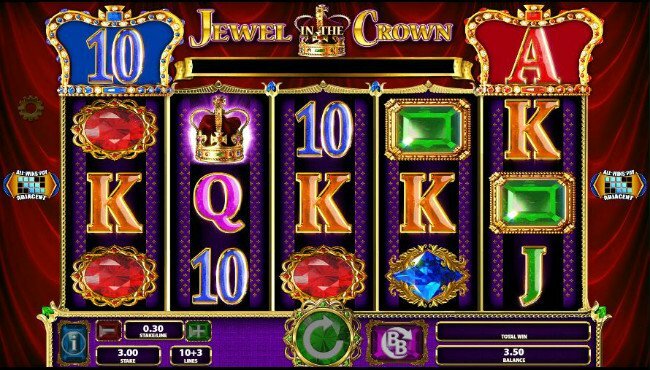 The Jewel in the Crown slot game is not going to cost you a packet to play. In fact, wagers on this 5-reel, 10-line slot are relatively cheap. 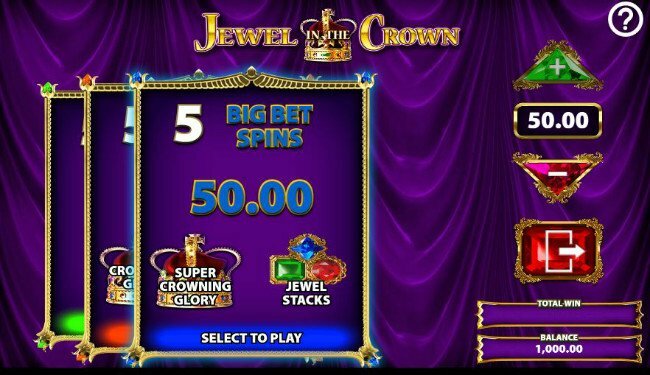 Players can ultimately place bets which range from 0.10 per spin, up to 500.00 per spin in the Jewel in the Crown video slot. There are also three additional paylines you can take advantage of in this slot, and you won’t find that feature in any other game from this developer. Place a bet worth over 2 coins, and you will trigger an All Ways Pay payline structure. Wild symbols appear as blue text framed with a golden border. These symbols can substitute for any others in the game, save for the crown jewels icon. The golden crown jewel symbols act as free spin triggers. When players land 3 of them on the second, third, and fourth reels of the base game, the slot’s feature will be triggered. It is also possible to play with a Big Bet mode in this game, just like in other slots from Barcrest. It can see players pay for extra free spins, and is worth it if you have the cash to spare. 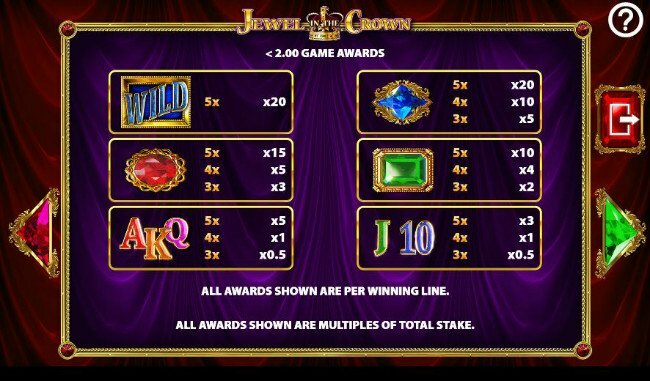 The only really enticing one of several Jewel in the Crown slot bonuses is the free spins feature. During this bonus, players will be given a total of 8 free spins. During that bonus round, all blue and red crown symbols above the reels will become stacked and wild. You can bag 1, 3, or 8 additional spins for landing 1, 2, or 3 of these crowns landing on the reels during the bonus. Jewel in the Crown is worth a look if you like low variance slots. There is a RTP rate of an amazing 98% in this game, and that is certainly appetising. The graphics may not look sharp, but they haven’t been designed that way. This slot has the look and feel of a great slot from yesteryear and that is the point. Most players will find it quite a decent slot to play. As a fanatic who enjoys gambling online I have great experience in this arena. I aim to provide others with all the necessary information regarding online casinos and online gambling. With my background and my experience you can expect to find unbiased, honest and detailed information, assisting you in enjoying your online gambling experience.